I was going to save this until the actual day, but the present arrived early and the Charleesi couldn’t wait to open it. 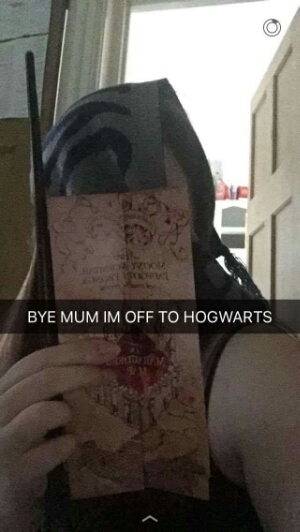 My daughter got her invitation to Hogwarts today. According to the Ministry of Magic it was sent by regular post because muggles had started noticing the owls, and this would put them off the scent a while. Included in the parcel was a wand, a deathly hallows pendant, a marauders’ map, and a few other odds and ends – and I have rarely seen the Charleesi so excited by a present (early or otherwise). She now knows why we put a Harry Potter film on when she visited this weekend, and why I mentioned how she was in the age group of muggleborn whose records were destroyed by Voldemort. I’ve had a stream of messages from her about it, and I’m so glad our geekeries are compatible. It’s particularly timely as she’s in the middle of her AS exams and starting to look at which university she wants to go to. I suspect Hogwarts would not be the easy option. This entry was posted in family, Geekery, idle musings and tagged birthday, family, geekery, hogwarts. Bookmark the permalink.